Disney World. most magical place on planet earth. so wonderful and whimsical! but not the kind of place you can just show up to for your family vacation - it takes some preparation and planning ahead! there is a LOT to do and see! and most attractions need reservations well in advance, like meals and even rides! 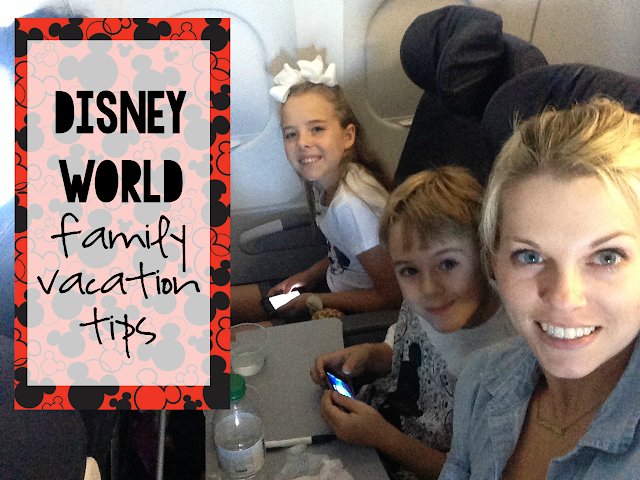 in the months leading up to our family vacation to Disney World, i was all over the internet reading tips and advice from other Disney-goers, and it was super helpful! after returning from our 7 day family vacation in Orlando at Disney World and Universal Studios, i have some tips and advice to share. this was our first time to stay at a resort on Disney property. in years past, we have stayed at a resort off-property and rented a car to get to the parks. and this was our first time to use the Disney Dining Plan. our past trips have involved driving to the Lake Buena Vista Walmart and stocking up on groceries, making PB&Js in our hotel and packing our lunch to take to the parks each day. this was our first time using Magic Bands: Fitbit type bracelets that are loaded with our pre-paid park tickets, hotel room key, dining plan, and credit card information. i didn't have to carry a purse with me at all! in the past instead of Magic Bands, our park tickets looked like credit cards. i think they still have those, and maybe the Magic Bands are for Disney property resort guests? based on our experiences, i definitely recommend staying at a Disney resort on property and taking advantage of the Disney Dining Plan. we typically like to take our vacation off-season to avoid crowds and inflated travel fees. this year was no exception - September was a great time to be at Disney! the longest line we waited in was maybe 20 minutes. everything else was 5 minutes or less, even without a Fast Pass! 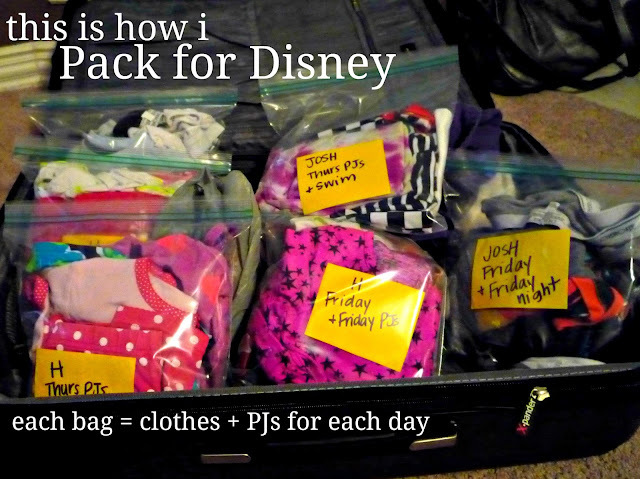 // pack kids' outfits, including pajamas, socks, undies in Ziplock bags 1 per day this is the smartest thing i've ever done! makes it so easy for the kids to wake up each day and know exactly what to wear. they just grab the bag of the day and get dressed. it also keeps the suitcase organized and minimizes bulk so you can fit more in the suitcase! // bring rain ponchos because it's Orlando and there's probably rain in the forecast. i bring them every time and we've never used them, but it was sure nice to know we had them just in case. i found our ponchos in the camping section at Target for less than $2. they are size "adult" but i figured we could tie up the kids' ponchos and it would still be effective in a rain storm. ponchos are also good to wear on water rides! i saw a lot of smart people wearing ponchos on water rides. // bring sunscreen because it's Orlando and there's probably sunshine in the forecast. and sunscreen at the park souvenir shops is marked up 300%. // bring balloons this might seem weird but we all know kids love balloons. i bought a pack of multi-colored latex Mickey Mouse balloons ($2 at Toys R Us) on a whim and it ended up being brilliant. cheap but effective entertainment for the kids during downtime in our hotel room. like when hubby and i were getting dressed and ready for the day, and in the evening before bed when the kids had a little extra energy- they blew up the balloons and played together. Bubba carried a balloon around the park blowing it up like a boss. 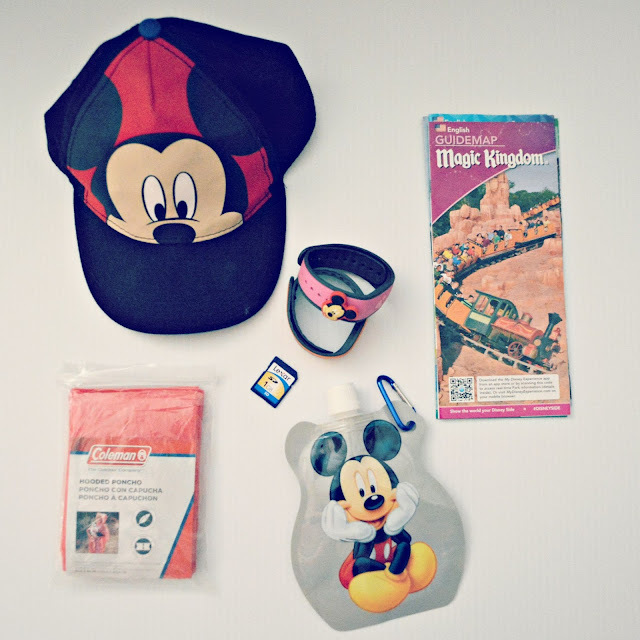 // pre-shop for Disney paraphernalia especially if your child's love language is gifts, do yourself (and your budget) a favor and pick up Disney trinkets before you get to Orlando. i found a lot of fun Disney gifts at Dollar Tree, Target, Walmart, even the grocery store for cheap! the hats were $3 a piece at Target. i found Disney "magic" washcloths at the dollar store, Mickey and Minnie Pez at the grocery store, and Disney reusable water bottles at Target One Spot. instead of spending big bucks at the park souvenir shops on the same types of gifts, i gave the kids these fun things before our trip. // bring an extra camera card if you don't plan to bring a laptop to photo dump, remember to bring an extra card for your camera. if you're wondering if you should bring your good camera, i say yes. we carried ours around our neck and got some really great pictures. we were also able to set up the timer and take some good family shots. but i forgot to bring an extra camera card so after the first few days, all i have are iPhone photos. thankfully i've learned a few things from David Molnar. // wear bathing suits under clothing if you plan to ride the water rides, especially at Universal Studios. there are some rides that you will get soaked. i'm talking head-to-toe you might as well have gone swimming drenched. these are the rides people are wearing bathing suits or rain ponchos. otherwise you spend the rest of your day in soaking wet clothes. // secure your Fast Passes ahead of time. you can do this on the Disney website or using the My Disney Experience app. decide which park(s) you're going to and figure out which rides you'll want to go on. get Fast Passes to avoid long lines. // take advantage of the My Disney Experience app. you can do a LOT with it- see Character Greeting locations and times, see showtimes, make dining reservations, locate park restrooms, and plan your daily itinerary. the app PLUS the park paper maps were helpful tools that we used often! // download the Heads Up! game and play to pass time in long lines. we saw another family doing this and it looked like so much fun. you could also play I Spy, the ABC game, Thumb Wars, or any other silly group game you can come up with. my tip here is don't just stand in line- make the most of that time together! make it fun! // Disney Cast Members and resort concierges are super accommodating, don't hesitate to ask them for help! // bring your own towels to Disney water parks, otherwise rent them for $10 each at the park. // Disney Dining Plan has healthy options for quick service and snacks. i was pleasantly surprised at all the healthy choices on the menus! // Disney World park food vendors offer free cups of ice water. we brought our own reusable water bottles / cups to refill from water fountains, but soon realized we didn't need to because we could get free cups of ice water from the vendors. how nice! // set a souvenir budget and save souvenir shopping for the last day. because there are a lot of gift shops at the parks, and a lot of ways to spend lots of money. you'll probably see something that catches your eye each day! on the last day of the trip, decide which souvenir deserves to go home with you. my favorite vacation souvenir is a Christmas ornament, or a keychain that i can convert into a Christmas ornament. and i prefer it to have the year on it, and be specific to our vacation. i brought home from this trip a keychain with Polynesian Mickey Mouse and i'll hand-write 2015 on the back so we'll always remember the year we spent a week at Disney World Polynesian Resort! // most of all, HAVE FUN! you're making memories that your family will cherish forever.